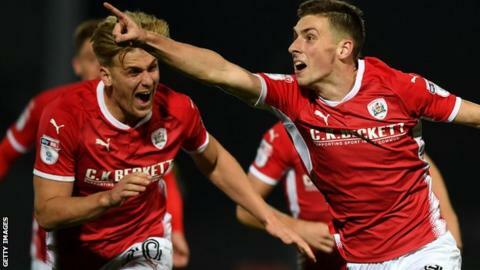 Barnsley eventually eased past a stubborn Burton side in an entertaining game of six goals at Pirelli Stadium. Lloyd Isgrove put Barnsley ahead midway through the first half with a left-footed strike but Matty Lund's header at the back post brought Burton level. Brad Potts restored Barnsley's lead from close range before Lloyd Dyer levelled again before the break. Joe Williams' stunning left-footed volley made it 3-2 before Harvey Barnes made sure of the points late on. Everton loanee Williams, 20, netted the pick of the game's goals, finding the top right corner from 25 yards out, a strike which put paid to Burton's spirited display up until then. The Brewers went into the match in poor form, losing four of their previous five league games, and Isgrove's opener suggested a long night ahead for Nigel Clough's side. The relief following Lund's equaliser was short-lived as Potts put the Tykes back ahead within three minutes. But Burton were back level soon afterwards as Dyer's decision to cut in from the right and shoot made it 2-2 with the last kick of the first half. After the break, Barnsley wrestled back the momentum and Burton had no answer to two quality second-half strikes. Despite winning, Barnsley stay 19th in the league but defeat sees Burton drop down to 23rd, just two points above bottom-placed Bolton. "We've had two games and it should be six points, but it's none. "It is very, very harsh on the efforts and the performances that we have got no points. It is very difficult to take. "Their lad scores a goal like he will never score in his career again and that is the difference between the two teams. "Having got back into it, 2-2 at half time, we were on top and all the way in the second half right up until the third goal." "It (Joe Williams' goal) was the first real moment of quality in the game if I am honest. It was a war of attrition up until then. "No one has come away from here with a win without earning it this season. Burton make you earn everything and we knew it would be that way. "I felt we had just settled down before Joey's goal. We had stood up to everything but didn't show any real quality. The goal was out of nothing and deflated Burton and when we got the fourth it was a comfortable 10 minutes at the end." Match ends, Burton Albion 2, Barnsley 4. Second Half ends, Burton Albion 2, Barnsley 4. Angus MacDonald (Barnsley) wins a free kick in the defensive half. Attempt blocked. Harvey Barnes (Barnsley) right footed shot from the left side of the box is blocked. Assisted by Tom Bradshaw. Foul by Matthew Lund (Burton Albion). Andy Yiadom (Barnsley) wins a free kick in the defensive half. Goal! Burton Albion 2, Barnsley 4. Harvey Barnes (Barnsley) right footed shot from the left side of the box to the centre of the goal. Assisted by George Moncur. Attempt saved. George Moncur (Barnsley) left footed shot from the centre of the box is saved in the centre of the goal. Assisted by Tom Bradshaw. Jamie Allen (Burton Albion) wins a free kick in the defensive half. Foul by Joe Williams (Barnsley). Foul by Luke Murphy (Burton Albion). Harvey Barnes (Barnsley) wins a free kick in the defensive half. Corner, Burton Albion. Conceded by Andy Yiadom. Substitution, Burton Albion. Luke Varney replaces Lucas Akins. Tom Bradshaw (Barnsley) wins a free kick in the defensive half. Attempt missed. Brad Potts (Barnsley) right footed shot from outside the box is too high. Assisted by Harvey Barnes. Attempt saved. Sean Scannell (Burton Albion) right footed shot from the right side of the box is saved in the bottom right corner. Assisted by Matthew Lund. Attempt missed. Lucas Akins (Burton Albion) header from the centre of the box is high and wide to the right. Assisted by Matthew Lund with a cross. Corner, Barnsley. Conceded by Lloyd Dyer. Substitution, Burton Albion. Marvin Sordell replaces Stephen Warnock. Goal! Burton Albion 2, Barnsley 3. Joe Williams (Barnsley) left footed shot from outside the box to the top right corner. Foul by Angus MacDonald (Barnsley). Corner, Burton Albion. Conceded by Ezekiel Fryers. Substitution, Barnsley. Tom Bradshaw replaces Ike Ugbo. Substitution, Barnsley. George Moncur replaces Cameron McGeehan. Attempt missed. Kyle McFadzean (Burton Albion) right footed shot from outside the box is too high following a set piece situation. Attempt missed. Matthew Lund (Burton Albion) right footed shot from the centre of the box misses to the right. Assisted by Jake Buxton with a cross following a set piece situation. Lloyd Isgrove (Barnsley) is shown the yellow card for a bad foul. Stephen Warnock (Burton Albion) wins a free kick in the attacking half. Foul by Lloyd Isgrove (Barnsley). Corner, Barnsley. Conceded by Ben Turner. Substitution, Burton Albion. Jamie Allen replaces Hope Akpan.